Lots of new things going on in my studio this spring. To start with, you should know that it is actually a NEW studio. I am still in the Foundry Art Centre in St. Charles but I have moved to a larger studio (Studio 9) on the other side of the building. I am loving the beautiful view of the river and people going by on the Katy Trail. When I tear myself away from window gazing, I have a studio that is almost double the size and is comfortable and perfect for classes and get togethers. See below for more about that. A few weeks ago I was interviewed and photographed for the Foundry Art Centre blog by Jillian Schoettle who did a fantastic job with both the writing and photography. if you haven’t read it and have an interest, I encourage you to check it out because it really tells a lot more about me, my thinking about my art and why I do what I do. I will be teaching a series of three workshops that I hope will be fun for both beginners and felters with experience. If you have tried felting before and thought it was too strenuous this may be the class for you since it will be possible to sit for a portion of the time. There are two felted 2 dimensional art classes (May 13th and July 8th) and one class making a felted vessel (June 10th). If you sign up for all three of the workshops then you will receive a discount of 10% Here’s a link for more information. You can bring your own project to work or work further on a project made in a workshop with me. 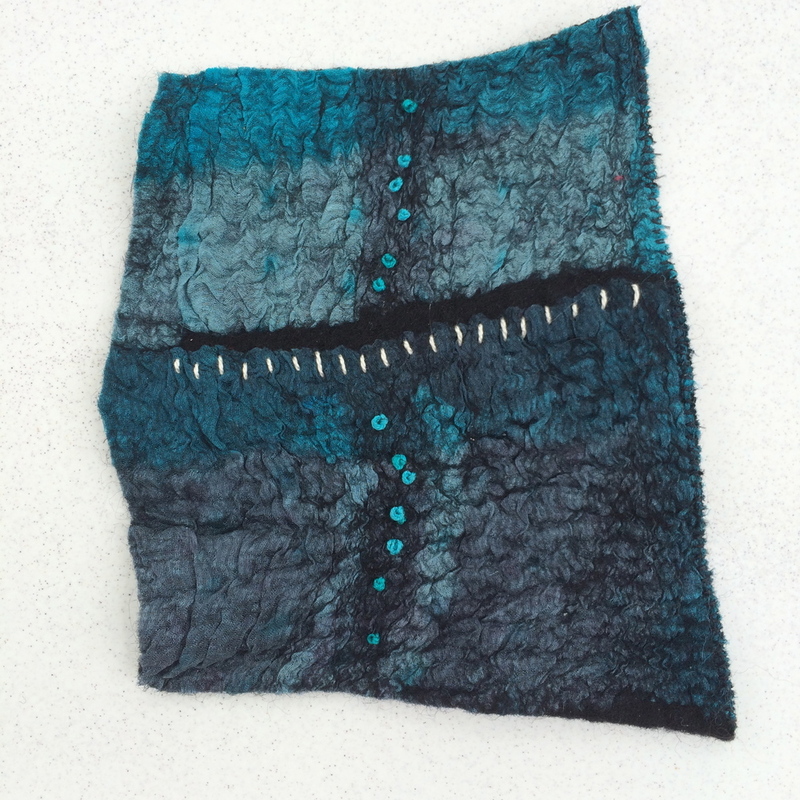 Some sessions will include a topic or a demonstration in some aspect of fiber or textile art. You will always be able to browse my library for inspiration. Some supplies will be included as well as beverages and snacks. There will be a $5 charge for the sessions and wool or silk fabric will be available for purchase as always. If you stop by the Foundry Art Centre during the month of May, you will see the result of a collaboration between myself and ceramic artist (and next-door-studio neighbor) Laura Hohn. Our exhibit is sharing the front wall at the main door during the Form and Function exhibit which opens this Friday May 6th at 5:30. I have four Nuno-felt wall hangings on display and Laura has a pitcher and cups as well as a flower brick. These are the largest pieces that I have made with the longest being nearly 8 feet. I learned so much from Laura about her craft as we shared the process of making pieces that would complement each other's work. My usual method of choosing colors for a project went out the door quickly as I discovered that for Laura, the colored glazes that she uses are developed and perfected over a period of time and are not easily changed. The limits on my color choices turned out to be a creative boost for me and led to discoveries of new palettes that I will use for years to come. The collaboration has been an unexpected and valuable experience for me and I think Laura would agree. We have discussed future projects pairing our "hard and soft" artwork. I hope that you will stop by and check out our work sometime this month and come by studio 20 and 21 to share your thoughts about our project. Though it took place awhile ago I wanted to mention a fun happening in my studio. I had a vat of luscious blue indigo dye available for the use by the other studio artists in March. Several made Shibori dyed scarves and we experimented with dyeing paper, leather, and even a gourd. Spring Renee my photographer neighbor took some beautiful photos of the process of making the indigo vat which I hope to have prints of one day. Melissa Whitwam, the Executive Director of the FAC who has an MFA in Fiber Arts, shared her love and extensive knowledge of the history and significance of indigo as well as her own exceptional indigo Shibori work with a group of us. I plan to have another round of Indigo week in the future which will be accompanied by a workshop in indigo Shibori. I am available most Fridays and some Saturdays starting in June for private classes for up to 3 people. Call (314) 368-5896 or email me: lj.hinrichs@gmail.com to reserve your day. Perfect for beginners or more advanced students; I will tailor a class to your needs. I am planning workshops for August and September so look for more information soon.